A variegated meadowhawk dragonfly, Sympetrum corruptum, that is. We look forward to breezes--even strong gusts--in our little pollinator garden in Vacaville, Calif., because often we'll see dragonflies touch down. They'll hunt, perch, and hunt again. The wind threatens to dismount them but they hang tight. Such was the case on Sept. 28, a time between summer and fall. Clouds parted, the sun burst through, and the Mexican sunflowers (Tithonia) and blue spike salvia (Savlia uliginosa) swayed in the breeze. This dragonfly swayed, too. But the wind did not defeat it. Not this "hawk." 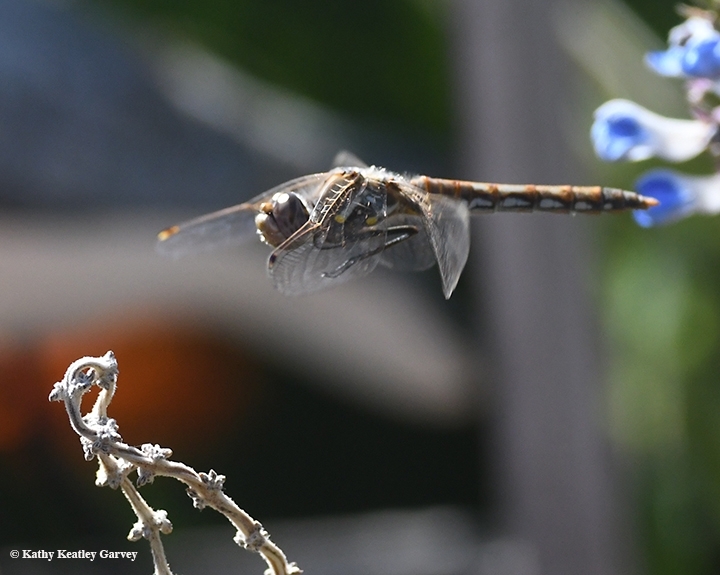 Variegated meadowhawks live near ponds, lakes, and swamps--and if you're lucky, they'll visit your back yard. They are largely tan or gray with a pale face that is tan in young males and females but becomes red in mature males, according to OdonataCentral.org. They're found throughout the United States and southern Canada; also Mexico south to Belize and Honduras. "This species may be seen on the ground more than other meadowhawks. It will also readily perch on the tips of grass stems and tree branches. It can be numerous flying over roads, lawns, meadows, marshes and ponds...It is largely tan or gray with a pale face that is tan in young males and females but becomes red in mature males." 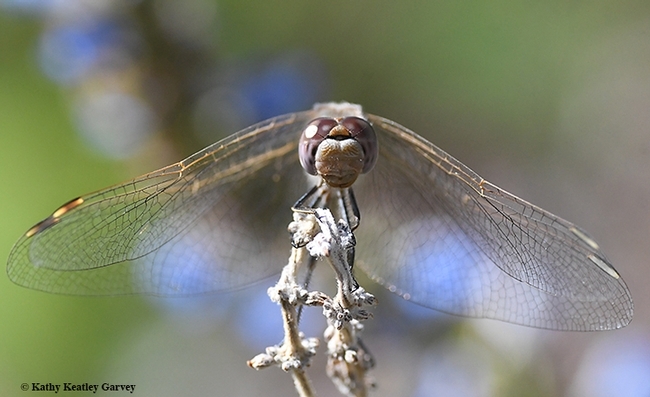 Interested in dragonflies? 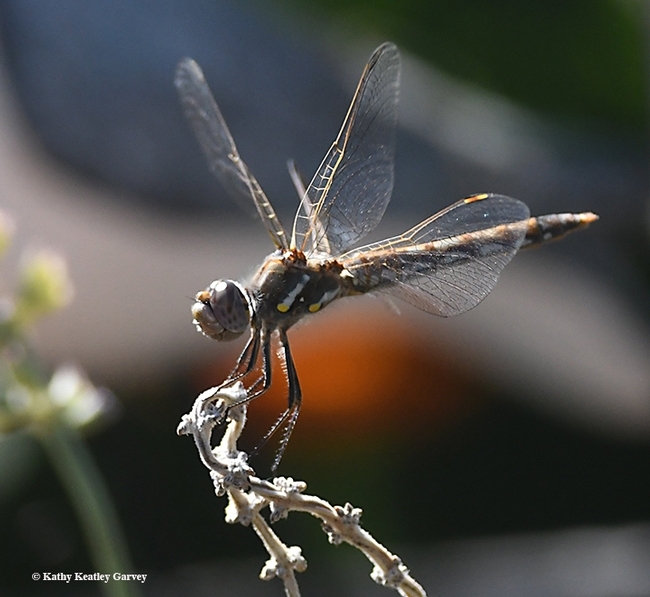 The Bohart Museum of Entomology at the University of California, Davis (located in Room 1124 of the Academic Surge building on Crocker Lane) offers a beautiful dragonfly poster, "Dragonflies of California," in its gift shop. 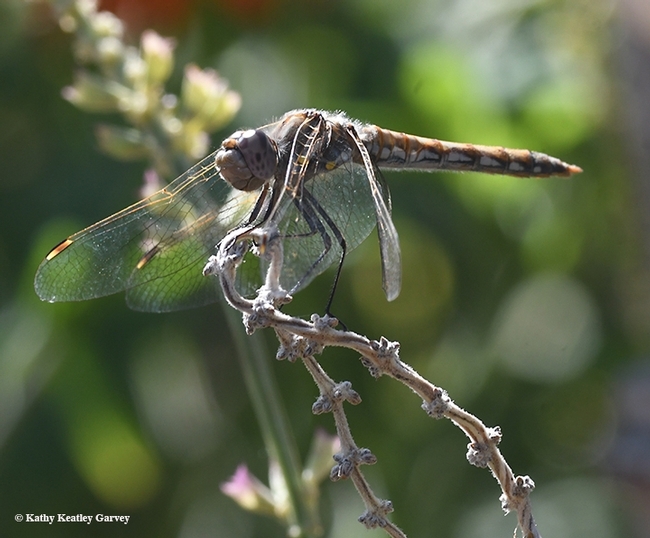 It's the work of entomologist Fran Keller (she received her doctorate in entomology from UC Davis and is now an assistant professor at Folsom Lake College) and naturalist-photographer Greg Kareofelas, a Bohart associate whose expertise includes butterflies and dragonflies.